Another day in work and I find out that in one of our projects unit tests suite executes in about 13 seconds. Wow! It was like 200ms before, so what happened? Btw - this particular project is a Python Google/AppEngine application. We use UnitTest framework for unit tests as well as mock library. One could say that it's not a problem as you don't test that often. Unless you do. In Ocado we really do TDD everywhere. E.g. in this particular project Guacamole we have git hooks that run unit - tests on every git commit. That's why we really want unit tests to run very fast. Personally I think that unit test suite that executes in more than 0,5s is broken. One more thing. 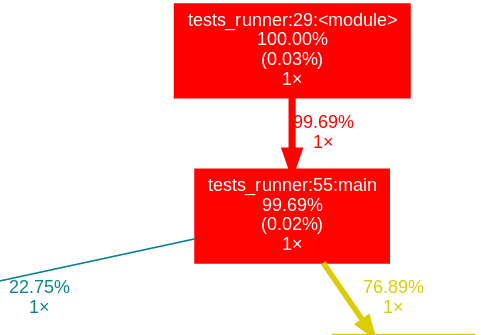 In order to run our tests we use tests_runner.py provided by Google - it's a tool that loads GCP SDK as well as detects our tests in project directory and run suite. It's important, as it's just another complication. You see? 13 seconds to run 47 tests - disgusting! So I git log / diff and I saw that we've got couple of new tests. But each of those tests brought something good to our projects, so it wasn't about removing those tests, but rather checking where is the root cause. I didn't want to remove any tests just because it executes slow. I wanted to find out why tests run slow and fix it. So as you can see - I sorted all calls by total time. So _socket.socket.connect() was called 18 times and it took circa 1,5s. Wow! And another 2 seconds on SSL socket manipulations. Wow and WTF? I mean - unit tests creating any socket connections and involving SSL processing? But from this point I just see that some of libraries used in the whole stack (in this situation _socket and _ssl) take a bunch of time to process some request. But searching for those particular calls can be like searching for a needle in the haystack. I could use pdb debugger and debug those tests (or in Pycharm's builtin debugger that I find much more handy) but still - debugging take a lot of time. I love Python because it provides me with so many tools and libs created by great community. 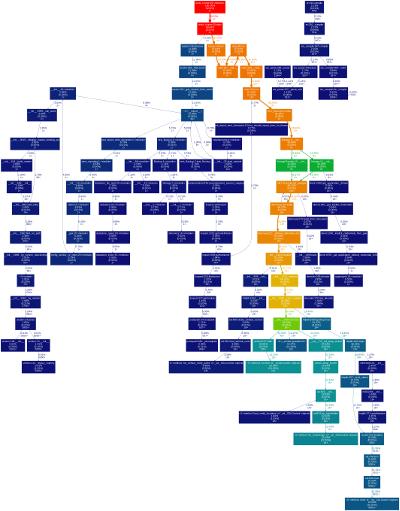 So there is this gprof2dot converter that takes output from cProfile and generates SVG graphs visualizing calls. Wow! 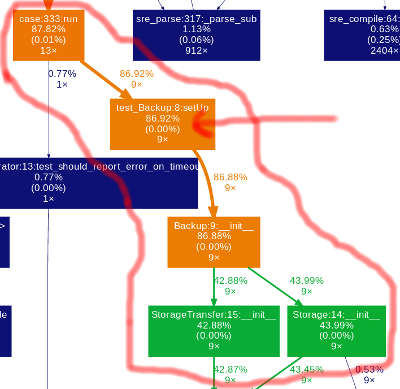 Actually this tool visualizes output from much more tools (see docs) - that makes it very generic and valuable. So where's the problem? Above code is a standard authentication for GCP and we thought it will be mocked by testbed.activate() (provided by Google) on some level. But as we can see - it wasn't. So every test we run there is an instance of googleapiclient.discovery.build created - and this object basically does all the authentication based requests (thus SSL, requests lib etc involved). Yes! It worked like a charm! From almost 13 seconds down to 0.047 seconds. That is a 27659% improvement, nice! And now mocking started working. So - profile, visualize and mock! Keep your unit - tests under 0,5s!